It’s never too early to start preparing for college, and one local mom wants to help. 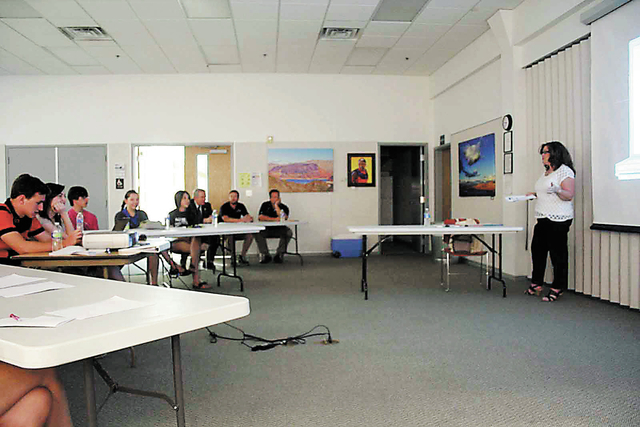 Roxanne Dey, a National Park Service employee with a part-time resume writing business, is offering a free college-prep seminar Saturday at Boulder City Library. The class, called “Dey’s Write to College,” begins at 2 p.m. and will focus on topics such as resumes, college applications, scholarships, testing and social media. A second class will be at 2 p.m. Nov. 2. “I think one of the things this class does is puts everything in one session that they may hear over the course of months (from school counselors),” Dey said. Dey said she began offering the class two years ago, when her oldest daughter was preparing to apply to college. “I started doing it because there was so much confusion over the process … people were individually calling me asking for help,” she said. Dey’s oldest daughter is in her sophomore year of college, and her other daughter attends Las Vegas Academy of the Arts, but she said she is still dedicated to helping Boulder City High School students. “I don’t have kids at Boulder City High School anymore, but I still really care about the kids there,” she said. Tino Ragone, a freshman molecular engineering major at University of Nevada, Reno, attended Dey’s seminar last year. “It was really helpful, with what universities are looking for you to include in your essays,” he said. In addition to the free seminar, Dey can be hired for one-on-one coaching. Ragone said that with Dey’s private assistance he was able to identify a subject for his admission essay. “She helped me identify that subject and really elaborate on that,” he said. The seminar is meant for parents as well as students, Dey said. “I learned so much when my first daughter went to school, and I thought, ‘Gosh, I wish someone had shared some of this information,’” she said. Dan Pellouchoud has three daughters who will all be attending college next year. Pellouchoud, a mechanical engineer, said Dey’s seminar helped him understand some of the modern aspects of applying for college. Although Dey is happy to assist with essay writing, she does not, however, write essays for students. Dey said she hopes her free seminar will help level the playing field for students who can afford thousands of dollars in test preparation courses, and those who cannot. To do this, she will talk about various inexpensive ways to prepare for college entrance exams. Those interested in attending should RSVP by emailing deyswritetowork@gmail.com.